My family spent many summer vacations in Tuolumne Meadows. These trips were a family affair and in the interest of keeping everyone engaged, it was more than fishing. We’d spend the days hiking to higher elevations — the campground was at 8,600 feet — and sometimes we’d end up at nearly 10,000 feet. Mepps spinners would be cast into water along the trail and sometimes the destination was a lake where fishing was rumored to be amazing. Mom would keep the troops focused by wondering out loud about what might be around the next bend. My brother and sister and I would spend countless hours exploring the banks of the Tuolumne River, watching the occasional bear that wandered into the campground, and waiting for the rare treat of visiting the campground store, where we’d get to pick one comic book and maybe enjoy an ice cream. 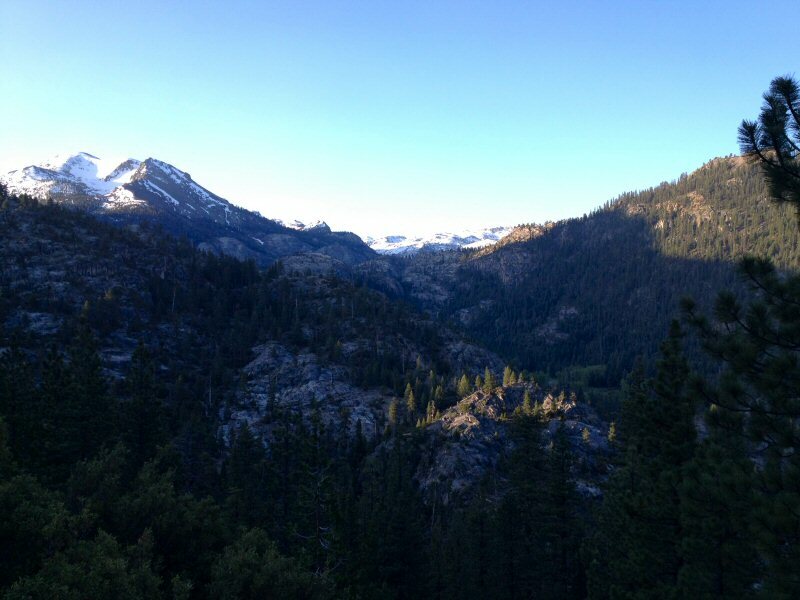 Idealization taints memories but, for me, the Sierra Nevada high country has always lived up to my recollection. That’s what fueled the rest of my plan for Memorial Day Weekend 2014. The view from where I started. 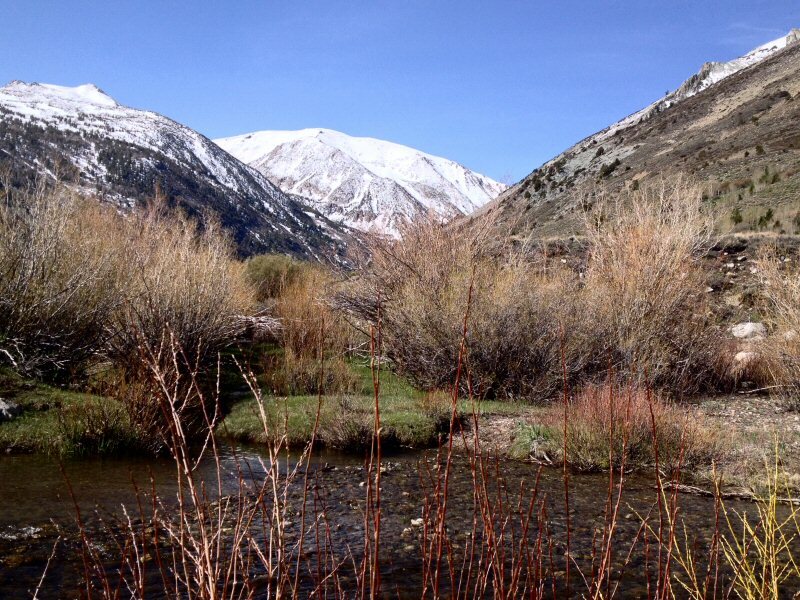 First-hand reports made it clear that water would be high in the Walker River Basin. But I had a plan that tied into two keywords in my last post: “maturity” and “adventure.” Not to get too personal, but I’m no spring chicken rooster, and for more than five years I’ve worn a compression brace on my right knee. Years ago, while carrying a bag of cement on my shoulder, I stepped into an unseen depression, twisted my knee and fell to the ground. I was young then, so shook it off. It was only years later that I began to feel a bit of pain after long walks. This year I finally got out of my rocker to walk every day. Not Forrest Gump style, but about five miles a day. That, in combination with weight loss, has eliminated the need for the brace. Cautiously optimistic, in planning for this trip I had decided to walk up the Little Walker River, hoping this would rekindle my enjoyment of high country hikes. I enjoy fishing this creek’s small water, though most of my experience had been limited to the stretch through and downstream of the campground. Sticking to my plan, I ignored warnings of high and muddy water. The drive over Sonora Pass would take about two hours, but it’s one drive that’s always enjoyable as the terrain changes with the elevation and, particularly this time of year, snow still dusts the pass. This day the drive was even more pleasant; being a weekday I saw only four cars at lower elevations, and no one above 6,000 feet. The section of Hwy 108 between Twain Harte and the junction with Hwy 395 rarely runs straight. It’s a good road and relatively fast considering the twists and turns. On the eastside, after beginning a descent into the high desert, there are at least four severe hairpin turns. It seems that every year I either run into a cattle drive on the highway or a semi-trailer truck stuck at a hairpin. This year it was another truck. I waited about 10 minutes as the driver unsuccessfully tried to free the drive wheels, which had sunk in the loose dirt on the inside of the turn, before walking up to ask if it would be okay to try to drive around on the shoulder. He helped me move a few big rocks. After getting past, I was talking with the driver, emphasizing that this hairpin was only the first, when assistance arrived in the form of a Ford Police Interceptor Utility in California Highway Patrol colors. The longest part of this drive always seems to be the three or so miles down a washboard dirt road to the Obsidian Campground in the Humboldt-Toiyabe National Forest. It’s not a bad drive, and was made nicer this year by a late-season storm that dropped enough rain to keep the dust down. Best of all: I was the only person there. I began hiking where a bridge crosses the Little Walker. Topographical maps showed a nearby trail, but that trail would only appear intermittently during my hike. This part of the river flows through a narrow canyon, and since my preferred tactic is to hike as far up as possible and return by slowly fish downstream, I headed for high ground. This is terrain marked by small and rounded granite cobbles, perhaps glacial debris, sandy loams and decomposed granite. Willow and quaking aspen grow along the creek, replaced by conifers and mountain hemlock, which tolerate a drier environment. Hiking was relatively easy. 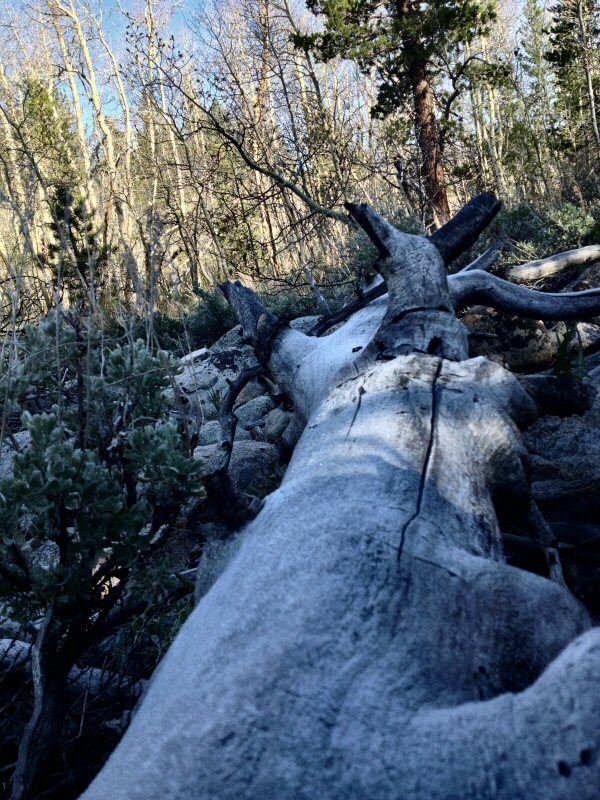 There’s not much underbrush and the only hurdles — literally — were the many downed trees. After about an hour I emerged from the canyon to find the wide-open expanse of Burt Canyon. Here the Little Walker meanders through stands of willows. The mountains that looked so far away when I started at about 7,400 feet seemed to be within reach. That was clearly an optical illusion as I was at about 8,600 feet and those mountains scraped the sky. The hiking was easy here and I continued on for about another hour. I find solitude to be refreshing, so I pulled up a boulder and sat. Handfuls of raisins fed my body. The silence of the mountains, the sound of birds and gurgling water, and the unfathomable history of this place, fed my mind and soul. It was as if I was one of only few humans to pass this way. The view in Burt Canyon, where I turned around. Shaking off such romanticism, I rigged up the 3 wt. rod. This is the type of water that begs for a dry fly, with the usual small dropper. I fished suspect water, sneaking through willows as best I could, but apparently not well enough. 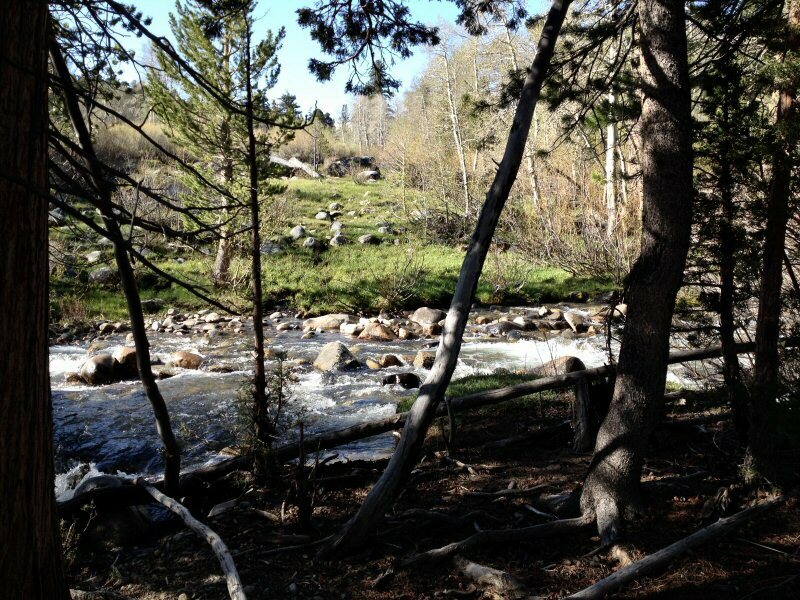 I re-entered the narrow canyon of the Little Walker River with only a single rise so far. It took a combination of hiking, climbing and crawling to follow the course of the creek, which wound around boulders, under fallen trees, sometimes cascading ten feet. The water was indeed high. Side arm casting, parallel to the creek was the best option. The fish were there, and a few rose to my fly, but none with enough an appetite to bite. If you fish, you know that there are those special spots that you know must hold fish. During high water flows, those locations change, and observation is the name of the game. I had taken to hiking above the narrowest sections of the canyon and noticed one such spot. A large boulder was forcing the creek to bend almost ninety degrees, so that even at high flows, a pool was created. A large pine offered shade and security. Hugging the conifer to hide my profile, my first cast fell into place and the fly slipped along a seam. I let it flow around the boulder until out of sight but before my fly line could spook any fish higher up in the pool. On the third or fourth cast a fish slammed the dry. This wasn’t a long pool, so the fish was resigned to head shaking and circling, but it did stress my little rod. I hadn’t expected to find a thirteen-inch holdover rainbow, but that’s what I was looking at in the net. That pool gave up a few more small fish, wild rainbow and brook trout of no more than eight inches, before I moved on. Confident these fish could be fooled, it was time to stop for lunch in a small meadow passed on the hike upstream. The entrée was a jelly sandwich — I forgot to buy peanut butter at Twain Harte Market — accompanied by pretzels and raisins for dessert. During this repast, telltale rises in a slow bend caught my attention. Lunch finished, I crept up to the edge of the creek. I made my first casts while still a few feet away; the high water had fish hugging the banks. The fish landed was a bright wild rainbow. A cast to the far bank brought up a couple of brilliantly colored brook trout. Feeling accomplished, I started to hike back to the car. Panorama from a stop along the Little Walker. The bridge where I had parked came into sight, and below another fly fisherman, dappling a small pool. In short order he had hooked a big hatchery rainbow. His problem was getting it in the net. The pool was at the limit of the reach of his 5 wt., maybe nine feet, and the skinny water in this wide spot of the creek meant the rod often had to manage the full weight of the struggling fish. It wasn’t until I was on the bridge and ready to render aid, that he had the fish in the net. We chatted briefly before he headed off to clean his lunch. That morning, in my focus on the adventure ahead, I hadn’t taken a good look at the water around this bridge. Now I could see that, directly underneath, it offered some interesting water. I clambered down. Fish hit my flies cast after cast. The hatchery rainbows were numerous and hooking one was a non-event. It was the occasional brook trout that made it fun. The challenge was getting my flies past the rainbows at the top of the run so the brookies at the bottom could get a look. I’m not complaining about having a chance at numerous fish, but I had come here for the wild ones. On my way to the Little Walker, a quick look at the West Walker revealed it was running high, but clear. Knowing that time was limited if I was to get back over the pass before dark, I packed up and headed to Pickel Meadow. During the regular season the Pickel Meadow dirt parking lot would have half a dozen cars in it. This early in the season there were only two cars and three fly fisherman. They had been fishing all morning and had found fish stacked up in a few bends. High-stick nymphing had worked best. And clearly, these guys have a more class than I; they were setting up a table and chairs for lunch, with all the fixin’s for Dagwood sandwiches. They also gave me explicit directions on how to get to the best spots (walk to the second willow and cast downstream) and told me to have at ‘em. Perhaps it was laziness, but I decided to stick with a dry dropper. The fish were easy to spot, and I’m sure I was from their point of view, so I tried to hide behind a third willow while casting upstream. Helped by a twelve-foot leader, good drifts prompted rises to the dry fly. Proving that hatchery fish tend to be dumber, I had landed almost a dozen in less than an hour. About then, one of the gentlemen from the parking lot walked up and asked what I was doing to hook so many fish. He was new to fly fishing, but enjoying it so far. We talked tactics and I again found myself in the role of teacher. I shared some flies with him and recommended other nearby waters. Then it was time to head back to the cabin. It’s taken me seven-plus years to take “catching” out of the equation of fishing. Now I’m able to hike, if not with the energy of my teenage self, at least without getting (too) winded or an aching knee. 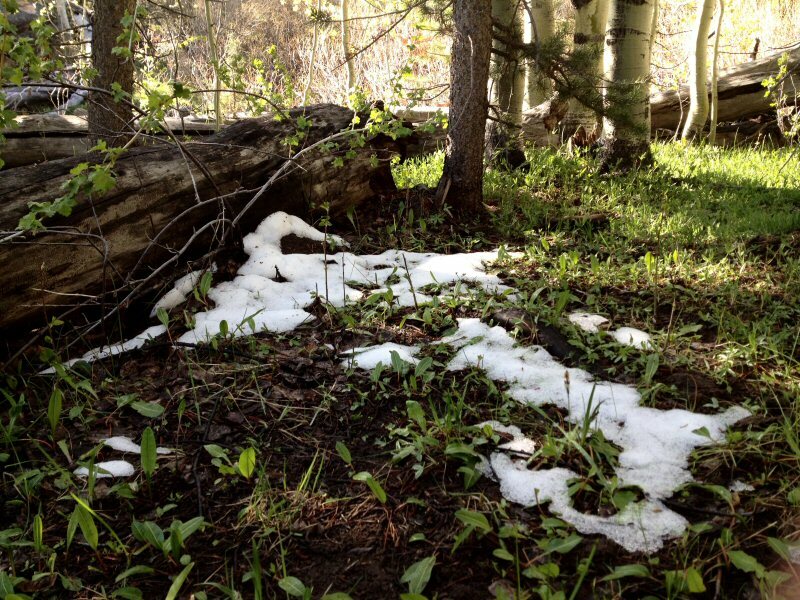 There was still snow in the shade. A copious amount flowing down the Little Walker. A great dining room for a modest lunch. The Little Walker River in Burt Canyon. Categories: Brook Trout, California, Casting, Eastern Sierra, Fish, Fishing, Fly Fishing, General Discourse, Hiking, Rainbow Trout, Sierra Nevada, Trout, Tuolumne Meadows, Tuolumne River, Twain Harte, Vacation & Travel, Walker Watershed, Wild Trout | Tags: California, catch and release, drought, Eastern Sierra, fishing, flies, fly fishing, forest, hiking, outdoors, rainbow trout, Sierra Nevada, trout, Tuolumne Meadows, Tuolumne River, Twain Harte, wild trout | Permalink. There was a lot of fishing and more hiking crammed into last weekend that originally envisioned. Much of the time, there was more of a focus on adventure and exploration than catching. Perhaps it’s maturity. Lessons have been learned the last few years and avoidance of the Bay Area commute dictates my departure time. Shoving off during the late morning and making a few stops along the way lead to a late afternoon arrival in Twain Harte. Being the Thursday before Memorial Day weekend, the town still had that hushed, pre-summer feel. With gear stowed and a few hours of sunlight left, it was time to preemptively get the skunk off. 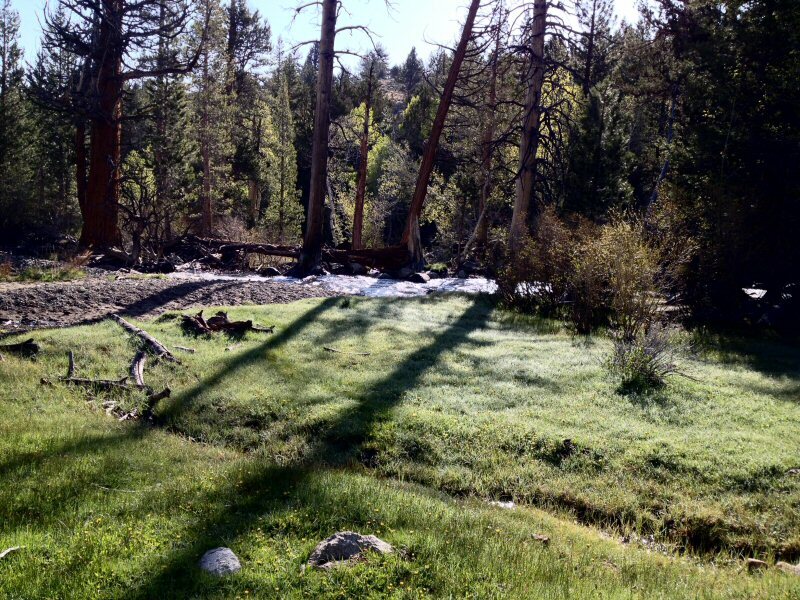 Fifteen minutes up the highway and ten minutes down a Forest Service road is a stretch of a fork of a relatively well-known Sierra Nevada river that offers prototypical put-and-take habitat with all the conveniences. It’s easily accessed, offers a picnic area and toilets, and the makeup of the river in this area naturally corrals the hatchery brood into three pools. The artificial twilight created by towering pines made it difficult to see into the water, but the occasional slurp confirmed they were there. This fork is just above 5,000 feet elevation, and generally doesn’t contain much water. Even less this year, compared to the same time last year. It seems to me that even factory fish retain a natural skittishness, which this day warranted a dry/dropper setup with a light touch. Half a dozen rainbow trout made it to the net in the following forty minutes. During that time, a couple of other folks had arrived to try their luck. The skunk off, it was time to head upstream. This is a place I usually think of as a quick venue to resurrect skills left unpracticed during the winter and to work the rust out. The spirit of this weekend, however, was to challenge myself. Hatchery fish clearly abide by that movie utterance that “…life will not be contained” and I was counting on this. About 100 feet upstream, this river is marked by pocket water winding through thick brush. The burble of plunge pools hinted at possible places where any wild offspring might be found. Dappling more than casting, I found a surprising number of the more attractive progeny. None were longer than six inches, making me wish for much smaller rod. 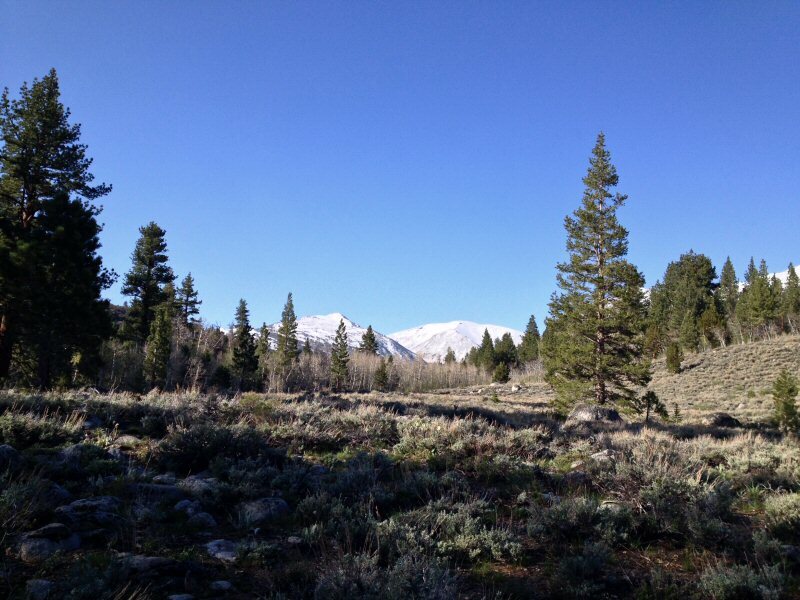 Sonora Pass (@Emigrant Pass): Where I’d be headed the next day. There’s a feeling altogether different about fooling wild trout. Granted, they are hungry and more opportunistic, and high-Sierra trout will take most any well-presented fly; but they require a stealthy approach. Over-lining these fish guarantees they’ll scatter. Every suspect pool — successfully approached — yielded a fish. After about an hour, I returned downstream. There still being light and good water available, there was time to make a few more casts. It’s fair to say, fly fishing, fully embraced, tends to permeate one’s life. Two years after attending a fly fishing class I had become the fly fishing club’s secretary, webmaster and was leading an annual outing. Later I was enlisted to help with that same class. One could have a long debate as to whether the hobby attracts those predisposed or the hobby itself engenders the idea, but paying it forward, it seems to me, is part and parcel with fly fishing. So it was, after a few minutes of hearing the crack of a fly line that I wandered downstream to find a woman waving a rod around in a most inelegant manner. Greetings were tentatively exchange with the question if she’d like a bit of advice. The next hour I offered a condensed version of fly fishing basics, kept within my limited sphere of knowledge. She had whipped the fly off her leader, so I gifted her a couple of flies and used the opportunity to demonstrate a dry/dropper rig. By then, the sunlight was fading, and having reassured myself that I could still manage to bring up a few fish after a winter away from fishing, it was time to head back to the cabin for dinner and an early bedtime. The morning would come early as my plan was to head over Sonora Pass and hike up the Little Walker River — despite warnings it was high and muddy earlier in the week. But as I said, this trip was more about adventure than catching. Categories: California, Casting, Drought, Fish, Fishing, Fly Fishing, Hiking, Rainbow Trout, Sierra Nevada, Trout, Tuolumne River, Twain Harte, Vacation & Travel, Wild Trout | Tags: California, catch and release, fishing, flies, fly fishing, hiking, rainbow trout, Sierra Nevada, Twain Harte, wild trout | Permalink. A few weeks ago in preparation for the coming trout season, I decided it was time to replace the line on my 5 wt. rod. I won’t say that I’m cheap, but this line had served well during its all-too-long life. It wasn’t as if it had developed any hinges or cracks, but last September the welded loop broke and I used a nail knot and monofilament to create a new loop-to-loop connection, then finished the season without having to replace it. But while I’m not a great fly fisherman and don’t demand perfection in my equipment, a floating line that doesn’t float is a bit of a problem. When I first set up this rod and reel, I used line purchased at a club auction. It was a great deal for a name brand line. Truthfully, I’ve since wondered how long it might have been in the club inventory. It would be hoped that it spent it’s time in a house closet; where the temperature was regulated and exposure to ultraviolet light limited, but it more likely spent its time in a garage, baking during the summer. This was a plain fly line, nothing special. Its entire length was that vibrant green that makes outsiders question how fly fishermen catch anything. In my pre-fly fishing life I too wondered how fish didn’t see that bright, large-diameter line, not knowing then that there was nine feet of leader and tippet that I couldn’t see, to which a fly was attached. I’m getting a late start this season, so replacing the line wasn’t imperative. The real decision was where I might get it replaced. I don’t have many choices in fly shops around here. I could drive an hour into San Francisco. There’s a new fly shop in the city, a shop within a shop, apparently, owned and operated by a guy well known in local fly fishing circles. I haven’t been there yet, but hear it’s pretty nice. There’s another shop south of me, not too far away and across a toll bridge. But like many local fly shops, it is one that seems to be only surviving, not thriving. It’s in the suburbs, not near any fly fishing destination, not in a convenient location and not in a high-traffic area. More than that, it seems that inventory is lacking. I understand it’s a business and inventory is money, and no business owner wants money sitting on the shelf. However, the last time I spent a significant amount of money in this shop was a few years ago, when I found a pair of the previous season’s waders on sale and was lucky they fit. I was apprehensive that this shop would offer much choice in the way of line. The other option was to head north, a little farther, but not an unreasonable distance. Luckily, my wife had suggested making a day of it, stopping at a new brewery, having lunch and casually exploring places we’d never stopped before. And this sporting goods store has a pretty good reputation for a wide selection of fly fishing gear and accessories. It’s a well-stocked store, divided into clear sections dedicated to conventional and fly fishing, as well as hunting. I was greeted the moment I walked in but left alone to ponder a myriad of fly lines. Without counting, I’d guess that between the different brands, types of line and specific applications for each of those lines, I was presented with at least 60 choices. I nymph a lot and boxes of lines dedicated to this tactic were printed with key words and phrases such as “easy mending,” “extra powerful turnover” and “high flotation tip.” Camouflage lines are neat, but I was hooking fish with the bright green line, so why change? After just about the right amount of time had gone by, the salesman who had greeted me sauntered up. We ended up discussing streams and rivers in the Sierra Nevada Mountains, and exchanged stories as fly fishermen often do. Obviously, this painted a good picture about my line needs. He told me of some of his favorite water and experience in aiding with the development and testing of fly line for one company. I tend to believe that most fly fishermen are pretty honest except when it comes to the fly that’s working that day, but I was a bit suspicious, and steeled myself for the hard sell. Still I stood there with the two fly lines in each hand, each the same brand I use on my 4 wt. rod. In one hand was the special-purpose, “highly textured” line; in the other was a standard weight-forward line for half the price. “What do you think?” I asked. I felt a bit embarrassed that he’d recommend the lower-priced line when I had walked in prepared to spend much more. I made up for it with the purchase of some flies, extra tippet, beads and other items for which I don’t have an immediate need, but will eventually use. I don’t know if this guy is paid on commission or not. Perhaps he’s evidence that there is such a thing as an honest fly fisherman. Categories: Casting, Fish, Fishing, Fly Fishing, General Discourse, Sierra Nevada, Trout | Tags: California, fishing, flies, fly fishing, fly line, fly rod, Sierra Nevada | Permalink. There’s a fear that can creep over me in the company of other fly fishermen. Those who know me personally are likely to agree there’s a touch of restraint in my personality. Blending into a crowd is specialty learned during middle school; let’s spin it as a well-honed survival skill. Thankfully, in the years since, I have been able to put myself out there with the backing of friends and colleagues, though I still haven’t totally abandoned my introversion. It was a recent podcast that made me realize that perhaps that fear coincides with the niggling thought that I may be a lazy fly fisher. But I will hike to the fish. 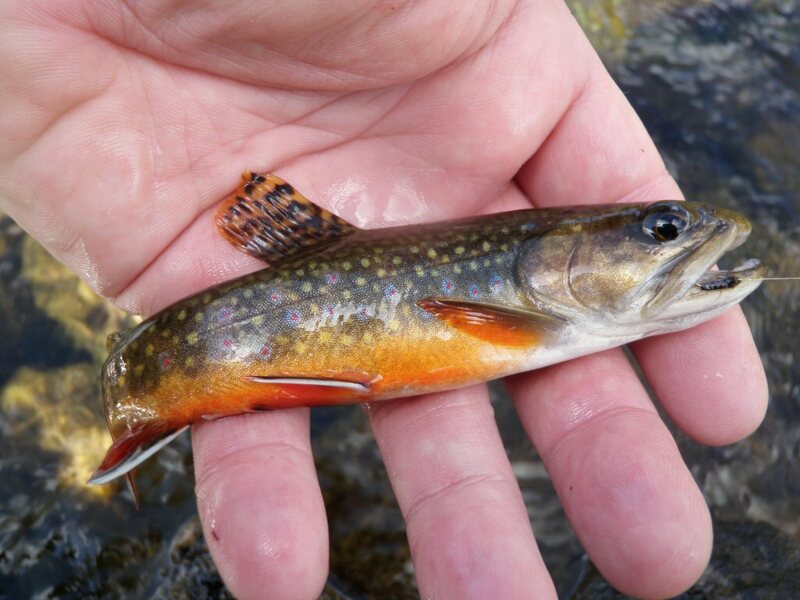 There was no hesitation last summer to march three miles into high-altitude lakes for brook trout no longer than the spread of my hand. I also tie flies. I built a fly rod. And it’s no problem getting up early to spend the day driving the 240-mile loop that takes me over Tioga Pass and Sonora Pass, alongside high-elevation streams and lakes as well as high-desert rivers. I still feel a bit unworthy among my fly fishing peers. When others are describing the physical skill it took to lay a dry fly in front of a big trout 40 feet away, across four different currents and through 30 mile-per-hour crosswinds, I have no response. Oh, I’m catching fish to be sure. Just with less effort. It’s called nymphing; often under an indicator or dry fly. It’s not that I’m apprehensive of trying different techniques. I’ll swing small wet flies, cast dries as far as I can — maybe 20 feet accurately — and chuck streamers when an opportunity presents itself. Thinking about it, after being hammered by messages in blogs, podcasts and online forums that nymphing is inelegant (it is), too productive to be considered a real challenge and more akin to lure fishing than fly fishing, it occurs to me that nymphing, in fact, requires a bit more creativity than other tactics. Nymphing often requires visualizing where your fly is and what its doing; rarely can you see it like a dry fly. It takes some thinking to set the depth at which that bead-head fly might be presented to fish hugging the stream bottom. Observational skills are much more important. With dry flies you can rely on visual cues. When swinging flies, the take is abrupt and obvious. Nymphing, however, requires keen observation of subtle clues: the movement of the rod tip, the twitch of a strike indicator, even a suspicious flash of color. It takes skill to discern a take from your fly bumping simply into a rock or snag or hanging up on weeds. What I’m trying to imply is that there’s another level of mental dexterity involved in nymphing and not required of other tactics. All tactics benefit from some knowledge of fish habits, hydrology and entomology and basic situational awareness. Guess that’s why it works so well for a day dreamer like me. Categories: Brook Trout, Brown Trout, Casting, Cutthroat, Eagle Lake Rainbow, Eastern Sierra, Fish, Fishing, Fly Fishing, Fly Tying, General Discourse, Hiking, Humor, Rainbow Trout, Rod Building, Sierra Nevada, Trout, Tuolumne Meadows, Tuolumne River, Vacation & Travel, Yosemite | Tags: brown trout, California, catch and release, Eagle Lake rainbow trout, fishing, flies, fly fishing, rainbow trout, Sierra Nevada, Tuolumne River, Twain Harte | Permalink. So this week my news feed coughed up an item about a Kickstarter campaign to fund the development of newfangled Tacky Fly Boxes. Reading the Tacky Fly Boxes vision statement it seemed to me that it’s not fly retention that’s my problem; it’s retention of the entire box. The entire box should be coated in tacky stuff. About seven years ago I stumbled upon a stretch of river that wasn’t more than 30 minutes away from the cabin by road, but in the early trout season offered an opportunity to fish in solitude. It’s an area deep within a canyon where dogwood and pines filter the sunlight. Only occasionally is the shade is broken by shafts of light, lending an emerald-green cast to the air. The river is lined by boulders much of its length here, and stepping from rock to rock is necessary. The excitement that comes with discovering new water was amplified by the willing rainbows. It was the kind of catching that’s so good you purposely slow down to savor each cast, hookset and fish itself. But this was my early days of fly fishing. I hadn’t yet acquired any habits or routines. At $1 or more each, they add up. The plan that day was to fish one river in the morning and another in the afternoon. When I arrived at the second river I reached into my vest pocket, unzipped and now empty. No fly box. It’d be a lie to say there was no panic. To those who say fly fishing really isn’t that expensive, try losing an almost full fly box. Buying a few flies at a time doesn’t seem like much; add them up and it can be tidy sum. After only a short internal debate I headed back to the first river. It should have been a futile search. More than likely, the fly box was about five miles downstream by now. Retracing my steps, on the last boulder, nestled in moss, was my fly box. I’ve adopted on-the-water rituals since then. I have lost a net to some trees while hiking through thick bush. One rod’s been broken. That fly box, however, was the one lost item that made me question taking up this hobby. I didn’t give up. It’s all been downhill ever since. Categories: California, Fishing, Fly Fishing, Fly Tying, Humor, Rainbow Trout, Sierra Nevada, Trout, Tuolumne River, Twain Harte, Vacation & Travel | Tags: California, fishing, flies, fly fishing, fly tying, rainbow trout, Sierra Nevada, trout, Tuolumne River, Twain Harte | Permalink. We got an early start driving up Rock Creek Canyon to the Mosquito Flats trailhead, at about 10,000 feet. It was a typically crisp fall morning when we geared up and begin hiking, which for stretches was more akin to climbing. It stopped every once and a while to catch my breath admire the scenery. Looking downstream (east) as Rock Creek exits Heart Lake. We had no particular goal, so about an hour in we departed the trail and headed to the inlet of Heart Lake, which is about a mile and quarter so up the trail. John dropped down to the trail-side of the inlet; I hiked to the opposite side of the lake. Quite a few years ago I hiked this trial, a bit further, fishing the lakes along the way. That year I caught nothing. I know now that it had been too late in the day. This early morning, however, there was plenty of interest, particularly if I could cast my orange humpy (dry fly) within a foot or so of the reeds lining the lake. There were spots, near inlets and outlets, where I would land half a dozen brookies, most colored up for the fall spawn. Most would slowly emerge from the depths or from behind a submerge log, and either lunch at my fly or flamboyantly refuse it. Typical brook trout, one of many, caught in Rock Creek and its lakes. We’d fish Rock Creek between two other lakes as we descended with the creek. I’d hook an occasional brown trout and stop often to just enjoy where I was. It was a beautiful day, with an ever-present breeze that kept things cool. The sun would be obscured every once and while by dark clouds; the almost black clouds I’ve only seen in the high country. John’s movement would mirror mine for the most part, though he did have to return to the trail to hike over a huge granite outcropping that prevented his following the edge of one lake. Throughout the morning we met other folks, mostly hikers with a few fly fishermen among them. There was a noticeable absence of hardware or bait fishermen. While the casting is easy on the lakes, greater stealth was required in the close quarters of the creek. Most of the time I would cast downstream about ten feet, piling up some line to allow for a relatively drag-free drift for another five to ten feet. Any closer and my footfall would spook any unseen fish. By the time we returned to the trailhead, it was time for lunch. My plan included a quick shower — I was going into town after all — and to meet John in Mammoth. We arrived just about the same time and it was easily decided to share a flight of regular beers as well as one of the seasonals. We had a good time talking with a server who worked the summer at Mammoth Brewing and would be heading back to Murphys (where The Wife and I enjoy the fruits of local winemaking), where he’s help with the grape harvest at his family’s winery. I walked out the door with a growler of Floating Rock Hefeweizen and one of Imperial Root Beer. Both the beer and root beer (which, to my taste buds, is easily one of the best root beers around) are long gone. The fish have forgotten who I am. This just means I’ll have to return. Wild brown that showed up in Rock Creek. 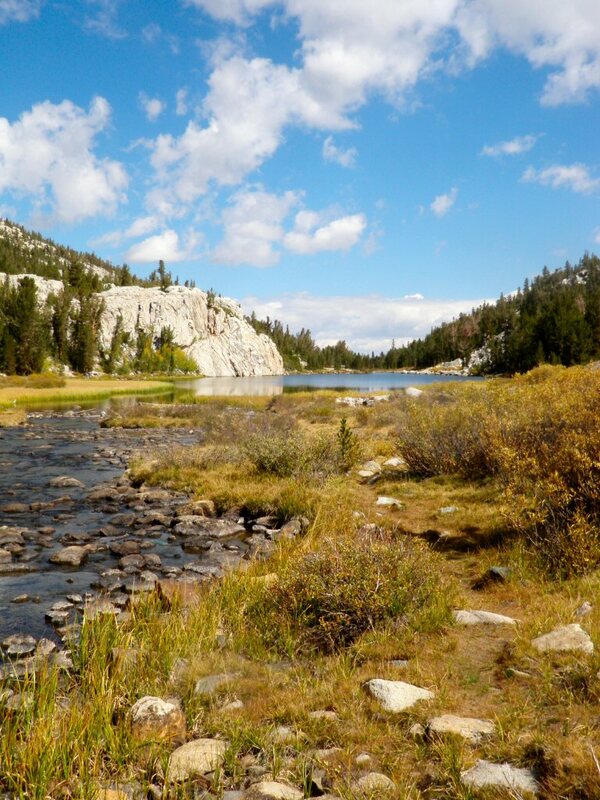 Categories: Beer, Brook Trout, Brown Trout, California, Casting, Eastern Sierra, Fly Fishing, Trout, Vacation & Travel, Wild Trout | Tags: beer, brook trout, brown trout, California, catch and release, Eastern Sierra, flies, fly fishing, Rock Creek, weather, wild trout | Permalink.